Surnames seem like something that have always been with us. So it can be surprising that the world’s population was once so small that first names were generally all that we needed. Everyone knew who Patty was and there was no need for formality. Surnames in Scotland evolved over time and the way that they did has had an impact on what surnames are most common in Scotland today. We can look through the top twenty of common surnames to see how these surnames came about. If you are interested in the origins of British surnames you can find that out too. Occupational Surnames – The most common surname in Scotland is Smith. The word “smith” originally meant that the persona was a craftsmen in that area – for example a gold smith. There were many types of smiths in villages throughout the UK; coppersmith, swordsmith, goldsmith, blacksmith and many more. Other common occupational names in Scotland are Stewart, Taylor and Clark. Stewart was a word for those that were guardians, Taylor for those that made clothes and Clark was a variation on the word clerk. Nicknames – The second most common name in Scotland is Brown. Words to name a distinguishing feature of someone would be given if many people had the same name. The common surname of Campbell comes from a Gaelic word that means crooked mouth. Other common surnames are Reid which surprising means ruddy or reddish complexion. The surname Young was generally given to a younger brother or sister to separate the family members. Patronymics – Scottish surnames had the same use of patronymics as the English. This means that the fathers name was used in the person’s name, for example John Donaldson (John is Donáld’s son). Mac was used a lot in Scotland to denote Son and Nic denotes daughter, this means that sons and daughters would have different surnames even from the same family. However, this use of the fathers name died out between the 15 to 18th century, this meant that instead of each generation having a different name, the surname became the same and used with every generation after. This majority of surnames in Scotland today contain son or Mac. 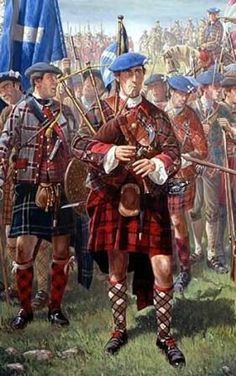 Territorial names – Scotland was ruled by the clans and generally the clan name was taken by people in the area. This means that it can be quite confusing when researching the family history as you may not be blood-related to the chief of the tribe. Also when a clan took over another area, people in that area would then assume that clan name. This showed solidarity with the clan and it helped to ensure protection from other clans. This means that they have been large groups of names used in Scotland. Also, some clans were banned from using their surnames, so they changed them when the ban was lifted not all clan member reclaimed their names or they changed them from the original spelling. Another way that Scottish people also took on surnames from their lands. Many Scottish people worked the land that was owned by a noble. They may have no surname but on the occasion that they did need one, they would use the name of the land or the manor that that they worked for. This means that although people may have the same surname, they may not necessarily be blood-related. Territorial surnames also came from describing an area that someone came from. Murray means sea settlement and Ross originally meant headland. Ethnic surnames – Scott was the most powerful clan in Scotland at one stage and the surname Scott is the ninth popular surname in Scotland today. Although first names change with the times and some become more or less fashionable, surnames still endure. A surname holds onto to its historical origins and starts another shoot on a family tree. A surname bonds people into a “clan” and a family. And when we search for our family tree, we gather up our ancestors under their surnames. Knowing how your surname came about is interesting and it can give you more inspiration to finding your way back to that very beginning. history of Scottish Surnames, Scottish Surnames, Surnames. Bookmark.